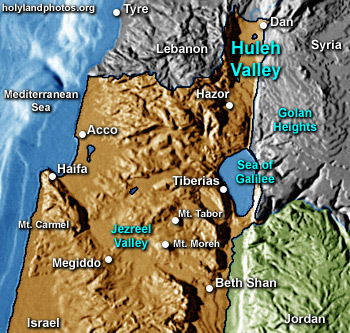 The Huleh Valley is located in the Rift Valley in northern Israel. It is 20 mi. [32 km.] by 5 mi. [8 km.] and receives about 24 in [600 mm.] of rain each year. The Jordan flows through the valley, but its course was impeded by a basalt outflow just north of the Sea of Galilee. Because of this, the Huleh was a swampy area up until it was drained by the Israelis in the 1950's. In ancient times it was called "Lake Semechonitis." Routes and settlements - such as Hazor and Dan - tended to be along the higher edges of the valley. For a geographical description of this region see Carl Rasmussen, The Zondervan NIV Atlas of the Bible (Grand Rapids, MI: Zondervan, 1989), pp. 31-32. To view for purchase Click Here.